When it comes to your pet’s health care, Bell Veterinary Hospital believes in giving you options—from the best of traditional veterinary medicine to alternative therapies that have been proven effective in relieving pain, speeding healing and restoring health. That’s why we offer acupuncture as part of our comprehensive suite of services. Acupuncture is a 3000-year-old Chinese practice utilizing hair-thin needles to stimulate the body’s nerve centers, improving blood circulation and releasing pain-relieving hormones. This virtually painless process relaxes muscle tissue and oxygenates the surrounding area, allowing the body to heal more rapidly. 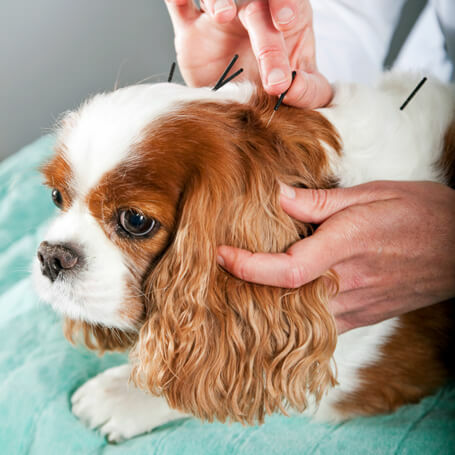 Acupuncture is one of the safest veterinary treatments available, has no side effects and is especially wonderful for senior pets or those who cannot tolerate medication. Some pets see results form acupuncture immediately, while others need a few sessions before they feel relief. Once we evaluate your pet’s condition, we can provide you with a customized treatment plan. Want to know if acupuncture can help your pet? Schedule a consultation online or call us at (205) 709-8286.